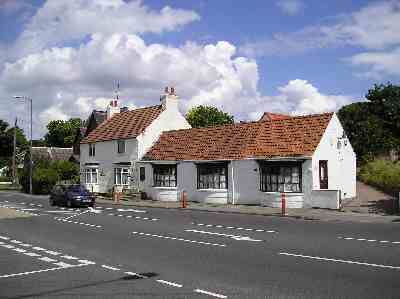 This row of buildings are standing in the position of two buildings that appear on maps of Marton from 1764 onwards. 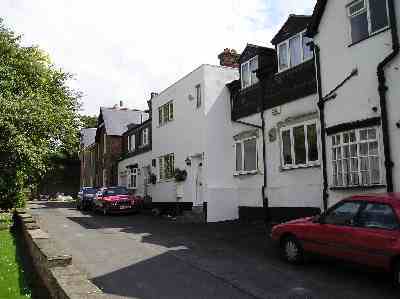 Although much altered, it is possible that they are both the original buildings. You can see that the last bay window portion of the single story dwelling is a later addition. < This row of buildings is at the heart of the west village and look onto what is now the green. The buildings closest to the camera occupy very old plots and are on the 1840 Tithe map. One house was rented by Margaret Harker, a shopkeeper and the other by Thomas Whitfield, a Cartwright. Thomas Whitfields house was partly surrounded by a field to the rear and it is quite possible that he worked from there. The rest of the row appear on the later maps of 1894. 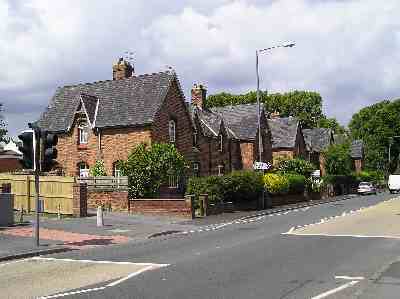 This row of houses was erected by H.W.F. Bolckow to replace those that he had knocked down when building his Hall and gardens. The church of St Cuthbert is just beyond the last house in the distance.